Transcription: Here is interred Michaliah Machla Kruvant, daughter of the righteous Zadok Mandel. Died on the 8th of Adar I, 5684. May her soul be bound up in the bond of eternal life. Here is one of the few photographs I have of my second great-grandmother, Minnie (Mojsabovski) Cruvant, wife of Moshe Leyb. 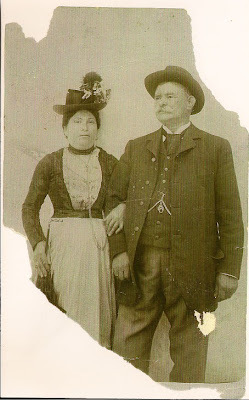 They immigrated to America from Lithuania circa 1875-1885. I continue transcribing in ten minute segments the tape my grandfather, Martin Deutsch, and his older brother, Ted Deutsch, recorded in 1977. They had begun talking about their immigration to America in 1913 (at ages 6 and 11), but have returned to talking about the farm they lived on in Transylvania. Ted: We had a place we called the cellar, but that was under the barn. Ted: We had enough to last the winter anyhow. In the spring we had to live out of the garden. New stuff coming up. Cucumbers. Ted: Yeah we had that, we had a barrel of sauerkraut. Martin: I thought you went in there and stepped on it to squeeze it down. I know you did that with wines and grapes. Ted: We did that when we made wine, yeah. We’d get in barefoot and press the wine. I don’t recall doing it on sauerkraut. I didn’t make that much of it. Martin: I had a recollection of that, but I might be wrong. Ted: I know we had to keep it in a barrel in the basement, and we had a big rock to keep the cover on it. Martin: And we probably had several barrels of it, so if nothing else you were going to have sauerkraut. Ted: Yeah, we had to grind it. We had that grinder. A primitive grinder. Two kinds of wheel connected to a rod, turn the wheel around. Ted: We made our own flour. Or if you wanted to there was a mill over there. Next to the river there was a mill. Martin: The old mill stream. Ted: The mill was built way down below the level of the river so we had a waterfall driving the wheel of the mill. Martin: Which was the common thing of course. Ted: You could take it there and they’d grind it for you for a small amount of money. So we had wheat stored, and we had corn stored. And when we wanted to use it we would grind it ourselves. The corn we ground ourselves, but the wheat we didn’t. I think the wheat we took to the mill. Martin: I know in later years I remember we kept chickens, so we had some eggs I suppose. If nothing else. Ted: Yeah we had eggs. Martin: We probably didn’t have much meat of any kind. Ted: We also made…during the season we made cheese from goat milk, or we also had lambs. People had lambs. We went up and they made cheese in big brown cakes, and we’d take the cheese home. That would last a long time. Ted: You always make that, and they stay a long time. But they have those big brown wheels of cheese they make up in the mountains and bring it down. They’d hang it up in the home to dry. Martin: I was just trying to figure out how we got our meats. We didn’t have any. Ted: Meats. We had a butcher that opened up once on Friday every week. That was the only time you could get meat. Martin: And your meat was probably poultry mostly. Ted: Poultry we used at home. We had poultry at home we raised. But if you wanted meat you could buy it at the butcher shop that was open once a week on Fridays. Martin: They probably would slaughter a cow or something, kosherized course. Ted: If you wanted a chicken killed you would have to go to the shochet who would kill it for you. You couldn’t kill it yourself. That’s how we got our meats. Martin: Well, Jean then took care of the crowd. It was only for a period of a year. Mother left there and I still haven’t – you showed me that passport, but I couldn’t figure out the year. I think the year was omitted in some way. Or it gave a year, of course a passport needn’t be used the time it was issued. You can have it in your possession for a year. Ted: We got here in this country in February 1913. Martin: February 1913. It sounds approximately. I saw a movie just a few nights ago on television of the sinking of the Titanic which was in October or November of 1912. I do remember from my own memory about discussions about the ocean vessel sinking. It was a deterrent at the time. Ted: I remember too. We had newspapers. Hungarian papers had the story about the sinking and the life lost on the Titanic. And the news came to us finally. It rippled down to the villages. Martin: It must have been a deterrent to most people that were thinking of coming over. Ted: It didn’t hit me as a kid. It didn’t mean much to me. Martin: It was still an adventure to you, I imagine. Ted: Even when I read about the disaster I didn’t realize at my age how many people died. It didn’t register with me even at my age. Martin: I’m trying to figure out a sort of…if mother came over one year before, which was 1912. Martin: Then she must have earned enough to put a down payment. Martin: Suppose she earned 2-300 dollars, that would do it, wouldn’t it as a down payment. Ted: Of course she lived with her sister, and she probably didn’t have to pay too much board or lodging with her. Martin: She probably borrowed some too. Ted: She put everything away. But she signed up and they gave her credit for the entire family if it …. I really don’t know what the amount was for the entire family. Maybe they got a rate for kids. You know, smaller kids didn’t have to pay, or half fare. But I would say the amount of at least 500 dollars. Which was a lot of money in those days. Ted: Which would also include train fare. Ted: From New York, and the train from Varalmas to Bremen. Martin: And you’re covering a thousand miles there. Ted: Maybe it cost more, I don’t really know. Martin: I think you had to come through Hungry and Austria, and then cross over through Germany to Bremen, which was on the West Coast of Germany. Ted: We crossed to Germany. We went to Germany. Martin: We had to get through Austria to get to Germany. Martin: You had to go North. That area where we were was almost the southeast corner of Austria Hungary. You see it ultimately was ceded to Romania, which was southwest of Hungary. Southeast I mean. Ted: We had to get to Bremen and I know we went through Berlin. That I know. Martin: You might have gone through Berlin. You might have gone up to Vienna and across to Berlin and over to Bremen. That’s my thought what happened. And do you think we took a train then? Martin: That’s right, I don’t have any kind of recollection. Ted: That was my first trip on a train. I’ll never forget it because we took the train. We went to Huedin, we got on the train. And I remember going through Berlin because they told us on the train this is Berlin, and I saw the first time electric lights over there in Berlin. Martin: I imagine that’s where I saw my first automobile. Ted: We stayed on the train to Bremen. We didn’t get off until Bremen. And waited there for the ship. The Bremen Rhein was the name of the ship. Martin: You think the Bremen Rhein. A German passenger ship. Ted: That was the name of the ship, the Bremen Rhein. We were on the ship for two weeks. One of the difficulties of transcribing audio is running across an unfamiliar word, and trying to figure out what is being said. For example, I heard what sounded like "polechenta" and from context sounded like it should be a Mexican dish of some sort my grandfather was familiar with and reminded him of a Hungarian dish. But it took several creative searches to come upon Palascinta - a Hungarian crepe. Recipes for sauerkraut do indicate pressing is necessary, but nowhere do I see any suggestion to use one's feet, as with grapes. The route from Varalmas to Bremen is definitely Northwesterly. I like how Ted's memory of the train ride to Bremen is reinforced through his recollection of the first time he saw electric lights at the stop in Berlin. Back in January I got the idea I would create a weekly list of notable blog posts and news stories related to genealogy. Others do it, and I've found stuff I've missed in their lists, and perhaps I can return the favor. However, my weekly lists ended after about a month. I had the notion to do this again a week ago. It may not be a coincidence that it is the beginning of another "New Year." The relationship to genealogy for some of the links below will be a stretch, but I felt the items were still worth sharing. 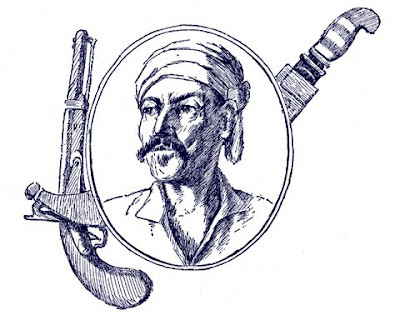 On International Talk Like a Pirate Day, Tracing The Tribe expanded upon my entry, and discussed additional Sephardic Jewish Pirates. The Genetic Genealogist has an entry on Tracing DNA to Individual Ancestors, and how scientists have been able to trace the genes responsible for some hereditary diseases. The official blog of JewishGen has an entry on how the Jewish Genealogy Society of Long Island helped a metal detector hobbyist return a class ring to someone who had lost their ring in Sag Harbor Bay fifty years before. I enjoyed Geneamusing's photograph on his "Wordly Wednesday" of a great great uncle using a 1916 telephone. Carnival of Genealogy: Tracing the Tribe is hosting the October 1st CoG, and the theme is to write an obituary for your blog. Here is footnoteMaven's official poster for the CoG. Hamilton's Habitat blogs about finding a photograph of her distant four-legged relative. And here's her entry a year ago when she learned about the woman. (A rare form of 'conjoined twinning' actually gave her two sets of legs.) The Genealogue had an entry on the woman, Josephine Myrtle (Corbin) Bicknell back in 2006. An article in the St. Louis Post Dispatch discussed how some schools are no longer teaching cursive handwriting, making some fear there will come a time when we are no longer able to read the letters of our ancestors, or other historical documents. Metro.co.uk has a 'Separated at Birth' story on how two twins met each other when they became employees of the same company. On evolution: The St. Louis Post Dispatch has an article on how chimpanzees in the Congo are developing 'tool kits' for hunting. DiscoveryNews has an article on whether mankind's evolutionary ancestors - Neanderthal and Australopithecus - were monogamous, and how scientists think they may be able to tell. The Daily Mail has an article on the completion of the Fifth Revision of Confucius' family tree, (hat tip: GenealogyBlog ) Back in February of 2008 I blogged about their decision to stop looking for more descendants. I first heard about the revision back in September of 2007, when I learned it would be the first revision to include his female descendants. Back in January of 2008, the 41st Carnival of Genealogy challenged us to come up with a dinner party of five - by inviting four ancestors, and including ourselves. I cheated and hosted two parties. From sunset Sunday to sunset Monday the Jewish community will be fasting for Yom Kippur. "Sarah" at the Jewish Publication Society blog asked the question: Which Five Jewish Authors Would You Invite to your Break-Fast meal?. She provided her five choices. Schelly Talalay Dardashti at Tracing the Tribe provided her five. While I'm not in the same position as I was in January of 2008, of having to choose between ancestors, I am grateful for having an additional seat at the table. 1) Joseph Heller (1923-1999) -- I was introduced to Catch-22 in high school and became hooked on Heller's brand of dark humor. I also read Something Happened, God Knows, Picture This, and the autobiographical, No Laughing Matter. 2) Howard Nemerov (1920-1991) -- Former US Poet Laureate, the late author was a professor at Washington University in St. Louis from 1969-1991. For many years he was my favorite living poet. I heard him perform when I was in 7th or 8th grade. However, my timing was off, and I was unable to have him as a professor before he died. 4) Mel Brooks (1926 - alive) -- I can't resist inviting the creator of Get Smart, The Producers, and History of the World Part I. He and Joseph Heller were actually good friends, and regularly ate together in a "Gourmet Club" with Mario Puzo, Carl Reiner, Zero Mostel, and Speed Vogel. So I suspect I might be able to get both of them to share some tales of each other, and their mutual friends. 5) Dorothy Parker (1893-1967) -- Because I need a woman at the table, I like her poetry, and I suspect her wit will be a fair match to the others. 1) They are all English-speaking modern authors, Dorothy being the eldest. Four of them are basically contemporaries, born within six years of each other. There are definitely authors from the deep past I could invite. However, this way there is no need for interpreters. 2) None of them were/are overly religious (to my knowledge). I suspect more than one would classify themselves as an Atheist or Agnostic. Though I suspect at least four of the five identify/identified enough with their religious heritage to fast on Yom Kippur. Note: I've decided to be a little more diverse in my selections for Poetry Friday, and I am no longer restricting myself to genealogy-related poems. Instead, I would like to share poems that move me, or inspire me. The Belleville News-Democrat reported on Monday that the city of O'Fallon, Illinois has put their city records online. O'FALLON -- If you want to peruse the city's bills or check on the ordinance about O'Fallon's special election of 1936, now you can do it from the comfort of your own home. As the culmination of what he called an eight-year project, City Clerk Phil Goodwin said any records someone might normally come down to City Hall to see are now available online. "With the assistance of the city's Information Technology Department, access to public documents via our Web site is now a reality," Goodwin said. "I have been striving toward this goal since I ran for office in 2001." To my knowledge, I don't have any kin who are current or past residents of the city. However, their new Public Documents section does contain information that might be of interest to Family Historians who do. The Public Documents section is set up as a series of folders and subfolders like on your own computer. 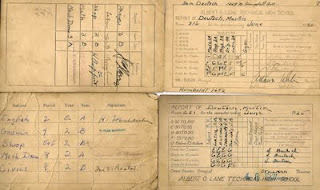 These are the records of most obvious interest to the family historian. There's also a Property Records subfolder under City Clerk/Public. These records aren't organized neatly by year, but the filenames contain the address, so if you know where a family member lived you might find something of interest. I haven't looked through all the documents, so there might be some other items of interest. There's definitely a lot there for those interested in the local government process, and history of the city. 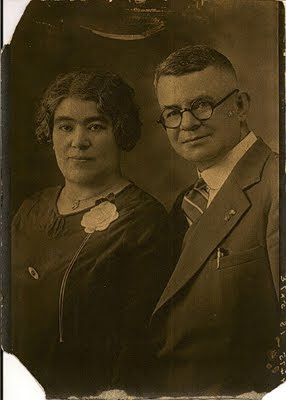 Believed to be Herman Dexter and his wife, Regina - as mentioned in the transcription Monday. The below tombstone is of my second great grandmother, Abigail (Stuart) Van Every, second wife of Samuel Van Every. She was born on April 29, 1825 in Ontario, Canada, and died March 4, 1866 in Middleville, Michigan. Cause unknown, but due to an infant who died after 3 days one month earlier, my guess is complications from childbirth. She is buried at Mount Hope Cemetery in Middleville. 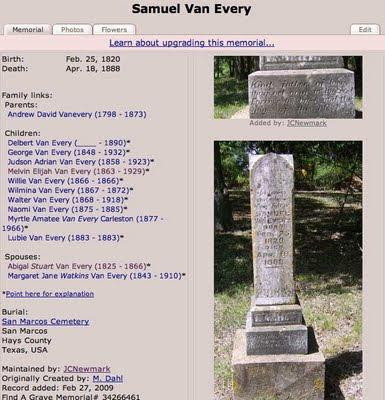 My great grandfather, Melvin Van Every, was three years old when she died, though his father, Samuel, married his third and final wife three months later on May 22, 1866. I know little more about her than the facts above. 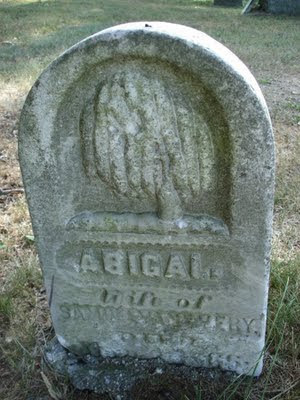 However, Abigail (or possibly Abigal, according to the tombstone) is the ancestor from which springs many of the branches that lead to my most famous cousins. Randy didn't speficy whether to round up or down for a whole number, providing me with a choice of two individuals. I chose the 'roulette number' of 17, which in binary is 10001. A side effect of using binary with ahnentafel numbers is that, ignoring the first digit, each 0 represents a father, and each 1 represents a mother. So 17/10001 is my father's father's father's mother. 1) Rose Cantkert Newmark was born in 1865 in Poland, possibly Warka, on the outskirts of Warsaw. She died on July 6, 1943 in St. Louis, Missouri, due to heart disease. 3) She only spoke Yiddish. Today is International Talk Like a Pirate Day. Today is also the Jewish New Year. 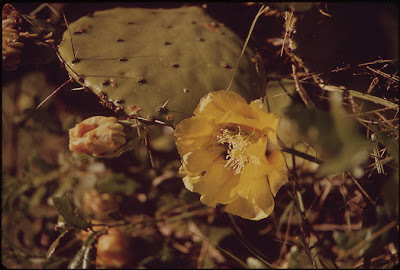 Last week for "Poetry Friday" I posted a Garland Cinquain I wrote about my grandmother, Myrtle Van Every. Here's a Garland Cinquain for my Second Great Grandfather, Selig Dudelsack/Feinstein. The Chesed Shel Emeth Society - formed on November 3, 1888 - was a chevra kadisha, or "holy society" for mutual assistance and especially for burial. [source]. They provided free burials for everyone, so that the poor didn't need to 'ask', or prove their need, at such a time. GRAMPS is the Genealogical Research and Analysis Management Programming System - Free genealogy software developed originally for Linux computers. (And obviously developed by people who like acronyms.) There is a Windows version, and recently they released a Mac Version. Warning: this page describes the GTK-OSX port of GRAMPS to Mac, which is still under test. This page too is still under construction. The program described may not work as expected. Or even work. Use it on precious data at your own risk! This warning indicates that the program isn't quite yet ready for everyone. But those who are more willing to experiment with software still being tested may be curious. Its test status relegates it to a secondary software program at this stage, but it is a free download, so there is no monetary investment. The key, as the warning suggests, is not to use it with original data files. That is, export a GEDCOM file from your primary genealogy software, and use that GEDCOM with GRAMPS. My primary software is iFamily for Leopard. 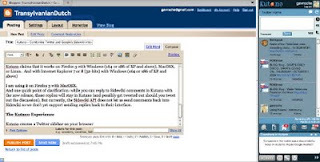 Back in 2007 after trying out MacFamilyTree, Reunion, and iFamily, I decided iFamily had the most user-friendly graphical interface. For me the most important features are ease of entering data, and ease of looking up data. However, iFamily has lagged behind in the reporting features. 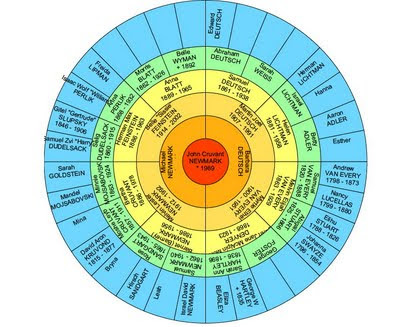 I was satisfied with the reports it offers, but it doesn't provide "Register" or "Ahnentafel" reports, which are the standard for many professional genealogists. GRAMPS does. For basic reports you can choose from Ahnentafel, Modified Register (NGSQ), and Henry numbering systems. From this report I learned my great grandmother, Margaret Denyer Van Every, was one month shy of her 15th birthday when she married, and two months shy of her 16th birthday when she had her first child. I knew she had been young, but I hadn't done the math. 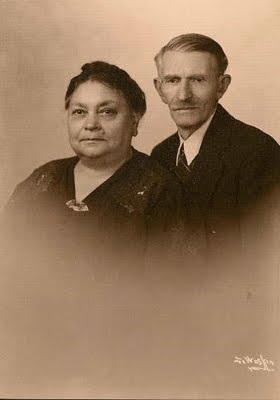 My great grandfather was five years older. However, it does illustrate a flaw in the code, as it appears GRAMPS occasionally gets confused over which of several spouses the correct ancestor is. Here it lists my great grandmother, Margaret Jane Denyer, as the daughter of George Foster - who was the second husband of Sarah Ann Hartley, not her first husband, Ebenezer Denyer. And its not just in the fanchart. I've noted in a descendant report that it included some stepchildren with the wrong parents. There may be other inaccuracies in the reports that I haven't noticed yet. So while the reports and charts available with GRAMPS are appealing, and show a lot of promise, it's probably advisable to wait for a little more testing before distributing the reports to family. 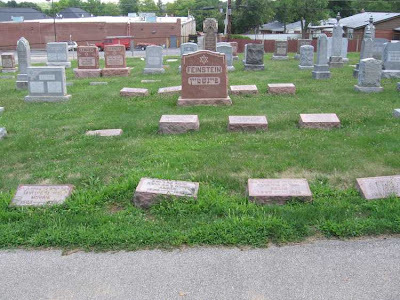 Approximately two months ago I discovered the joys of FindAGrave.com. The website has “over 36 million” recorded memorials. Some entries have just name, dates (if available on the tombstone), and the name of the cemetery. Other entries have photographs of the tombstones, and/or of the people, as well as biographies. It depends upon what has been entered - by family members, or often by volunteers who take the time to record entire cemeteries methodically, section by section. I conducted some searches on some of my surnames, and made some connections with a few distant relatives who had uploaded photographs. Then it occurred to me that if I added memorials for family members not already on there, others could find me. While some bloggers take great pains to be anonymous -- geneabloggers often have the opposite desire. We want to be found. It's always easier when distant cousins end up finding us. As I mentioned above, many of the volunteers creating memorials are creating them in bulk for cemeteries, and aren’t related to the deceased. FindAGrave has set up a system where a family member can request that the individual who created the memorial transfer its management. If you are closely related (The deceased is your sibling, parent, grandparent, or great grandparent), they can’t reject you. (Unless they too fall within that range.) Outside of that range, it is their choice, though I have found most I have asked to be more than willing to transfer management to a family member. I am currently managing 103 memorials. Below is the memorial I am currently maintaining for my second great grandfather, Samuel Van Every. It is one that I didn’t personally create, but I had transferred. 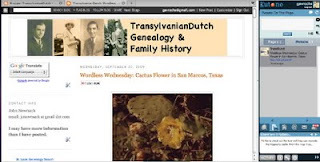 I have added all the “Family Links” which link the memorials to each other, creating an effect similar to a family website. Samuel had 22 children, though I currently only know the burial location of 10 of them. I also haven't figured out the location of his first wife, Cordelia Hitchcock, who died in Brant County, Ontario in 1846. When you indicate on X’s page that Y is their parent, on Y’s page X is automatically listed as a child, with an asterisk indicating that the relationship wasn’t added directly to the page but inferred. The same thing happens with spouses. I have linked as many memorials as I can, so by providing a link here to the memorials for both of my grandmothers -- Myrtle Van Every Deutsch and Belle Feinstein Newmark -- those interested can find almost all of the memorials of my relatives that I have so far found, or added, simply by following the links. 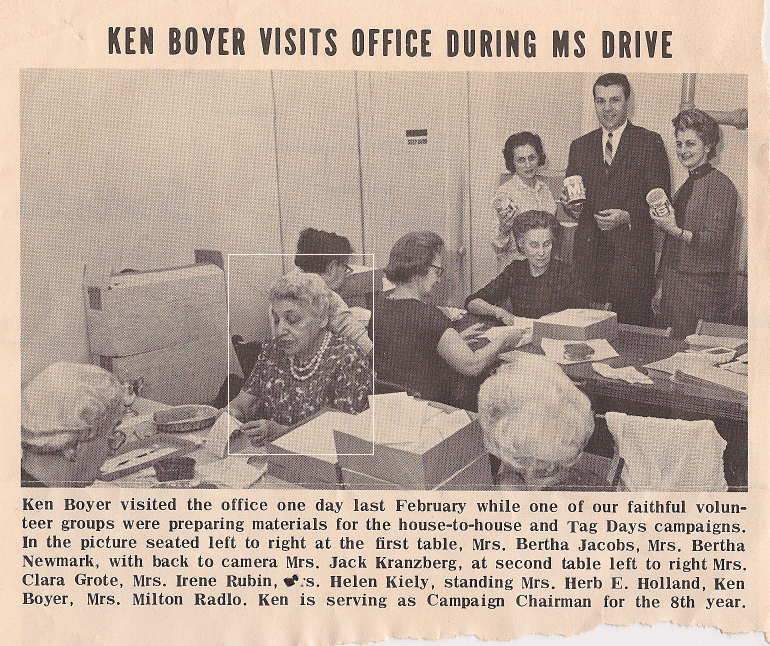 Caption: Ken Boyer visited the office one day last February while one of our faithful volunteer groups were preparing materials for the house-to-house and Tag Days campaigns. In the picture seated left to right at the first table, Mrs. Bertha Jacobs, Mrs. Bertha Newmark, with back to camera Mrs. Jack Kranzberg, at second table left to right Mrs. Clara Grote, Mrs. Irene Rubin, Mrs. Helen Kiely, standing Mrs. Herb E Holland, Ken Boyer, Mrs. Milton Radlo. Ken is serving as Campaign Chairman for the 8th year. Source: Multiple Sclerosis Society, St. Louis Chapter, Bulletin, June 1967. Translation of Hebrew inscription: Here lies Toba Oberman, daughter of Reb Samuel Zvi, died 9th of Av, 5695. May her soul be bound up in the bond of eternal life. She was the daughter of Gitel. It is her death certificate which provides the only documentary proof of the ancestral Dudelsack surname, as her "father's name" was recorded by a daughter (phonetically) as Samuel Harry Dudelzock. Her mother, and two brothers, changed their surname upon arriving in America. However, she married before coming to America, so I suspect in her mind her maiden name never changed. As I've noted before: Zvi is the Hebrew word for 'Deer'. The Yiddish word is 'Hirsch'. When Americanizing their given names many Jews looked for common American names with as many matching consonants as possible, using either the Hebrew or the Yiddish variant, so Zvi/Hirsch often became Harry. Actor, Patrick Swayze died today, September 14, 2009, at age 57. [source] This didn't come as a surprise, as the world has known he was struggling with Cancer since March of 2008. Still, many had hoped he would find a way to evade the disease. Two years ago, I confirmed the Swayzes in my family tree intersected with his ancestry. I was still working at AG Edwards in their IT department. Very little got done that day, as there was a television in the hallway that was constantly set to the financial news network, which like every other news network, focused on that morning's events. And when half the department is standing in the hallway watching television, not very much gets done. When not in the hallway, I was at my desk. Had to look like I was doing something. But I was following the news on the Dow Jones Newswires, which we could access from our computers. It was a Tuesday, so that evening I was at Writer's Group. There were more people there than one might expect. Why weren't we with family? We were. Which shouldn't be interpreted as a slight against our biological families. But we'd either spent several hours that day already with them, or knew we would in the days to come. 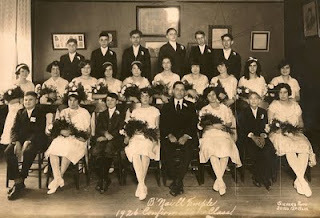 The last two Wednesdays I have posted for Wordless Wednesday photographs received from a first cousin of my mother's. There was no writing on the back of the photographs and the cousin was unable to identify them. However, they were with other photographs of Deutsch and Lichtmann kin, so we are relatively certain (no pun intended) they are from those family lines. It is my understanding that both the Lichtmann and Deutsch families were Orthodox Jews. And the individual on the right looks like traditional images with which I am familiar. Not so the individual on the left. The head covering the relative on the right is wearing appears reminiscent of what I sometimes see Hasidim wear. The relative on the left appears to be wearing a more 'cowboy-style' hat to me. Though it may just be the way the hat is turned. Even more interesting than the hats, is the facial hair, or the lack thereof. Not growing up in an Orthodox household, and used to 20th and 21st century changes in tradition, this difference didn't occur to me until I pasted their faces one next to the other. My Great-grandfather, Samuel Deutsch, also didn't have a beard. 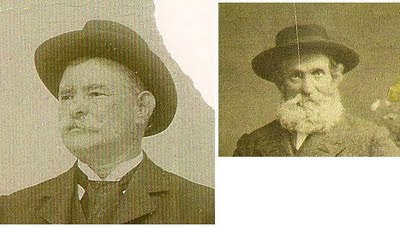 This may be representative of a generational break with tradition, as if the two pictures are from a similar time period, the individual on the right appears older. The woman in last week's photo is holding a book. I'd like to be able to put some names to these faces someday. Perhaps similar pictures will turn up in other cousin's collections, but with labels. I've always been amazed at what my maternal grandparents, Martin and Myrtle (Van Every) Deutsch saved. 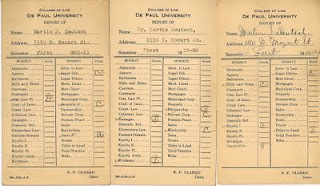 Above I show two semesters of high school (front and back), and three semesters of law school, though my grandfather saved all of them. I like seeing my great grandfather's signature. They also indicate when the Deutsch family moved from Campbell to Mozart street in Chicago. 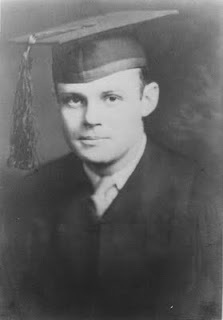 Here's a photo from one of his two graduations. I don't have a date on it, so I'm not certain which one. I'll finish with a class photograph including my paternal grandfather, Melvin Newmark, from 1926, when he was 14 years old. It was his Confirmation Class from Bnai El in St. Louis. I've drawn a box around my grandfather. Generationally, the oldest family tombstone in America, on my father's side, is that of my great great great grandmother, Gitel (Slupsky) Dudelsack. Her tombstone says she was born in 1831. Her death record says she was 60 years, five months, and 21 days when she died. That converts to Feb 13, 1846. Taking into consideration when her children were born, 1831 is more likely. From the tombstone I learned my great-great grandfather, Selig, was named after his maternal grandfather. Gitel is buried in the Feinstein Plot at Chesed Shel Emeth cemetery in St. Louis, Missouri. Her stone is in the front row on the far right. 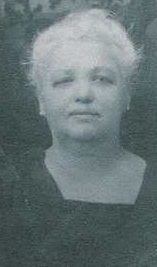 Gitel immigrated in 1891 under the surname Feinstein, with her daughter-in-law Annie, and several grandchildren. Her son, Selig, had immigrated in 1890 under the original surname Dudelsack. The reason behind the surname change is uncertain. Family lore said that Selig changed it to match the person in front of him in line at Ellis Island. One problem with this is that Ellis Island wasn't open yet, and Selig went through Castle Garden. I've searched through the Castle Garden records to see if there were any Feinsteins who arrived at the same time as Selig, and I didn't find any. It's actually possible that Selig's mother or wife were responsible for the name change, or Selig changed it upon arrival, and wrote to them and told them of the change before they made the trip. * Gitel's memorial at FindAGrave. I am taking a holiday from my personal Amanuensis project, though if you have posted a transcription, feel free to add a link to your post below, or in the comments. Now, Sergey argues that the correct thing to do is to just connect it straight to your brain. In other words, you know, wire it into your head. And so we joke about this and said, we have not quite figured out what that problem looks like…But that would solve the problem. In other words, if we just - if you had the thought and we knew what you meant, we could run it and we could run it in parallel. As the article indicates, the point of Schmidt's joke (It is a joke, right?) is that search engines have a difficult time reading our minds. Labor Day Weekend begins today in the United States and Canada, and culminates on Monday. (Many other nations celebrate it on May 1) In honor of the holiday, I thought I would share some Labor-related poetry. Most of us have ancestors for whom the words in these poems might ring true.